Does anyone have any experience with the Hannigan trike conversion of this bike? I’ve reached the point where I’m starting to be concerned with my ability to come to a stop in traffic, having had several back surgeries and facing a hip replacement in the near future. I love my R1200RTW, and it is hard to give up that feeling of threading my way through the twisties, but I want to face reality before I have a disaster. I have a chance to buy a 2014 GTL trike with 2000 miles. I’ve ridden it for a few miles, but just am not sure of its handling. I could also go with a new CanAm F3 for about the same price, but again, I’m not sure of the handling capabilities of that configuration. Anyone with experience, I hope you can share your thoughts or suggestions. None here, but lately I've been thinking of a new ride with a side car. I really love my K1600 GTL and she is still an awesome ride. She really seems to get better and better every time I'm on her. I don't do the long tours that I used to do and all of the rides now are less than several 100 miles. It just seems like a side car would be fun. I've never been on one, but there are several classes in the area that I might take before making a purchase. Maybe, in your situation, try the same with a trike. Just a quick couple of thoughts. Sidecars are fun and having previously owned two sidecar rigs when I'm ready to graduate to 3 wheels that's probably the way I'll go. However, driving a sidehack requires a totally different set of skills than a standard trike and, like Dan said, if you consider taking that route please go take a class. As far as a standard trike vs a CanAm, the CanAm will require much less effort to control than a trike. Modifying the front end steering geometry on a trike will reduce steering effort but not to the level of the power assisted steering on the CanAm. Also, for what it's worth, the CanAm also offers electronic skid control. Test ride both machines before making a decision. DanDiver and Patric like this. I love my 2012 K1600GTL with hangman conversion. The steering took some getting used to, but I have taken cross country trips on it. Just remember "pull with outer hand, push with inner" on turns and curves. They have an option that adjusts the rake for easier steering, I do recommend that, although I have not tried it both ways, so, as they say, your mileage may vary. Good luck. If you are neR Minnesota, let me know, you can he k it out. 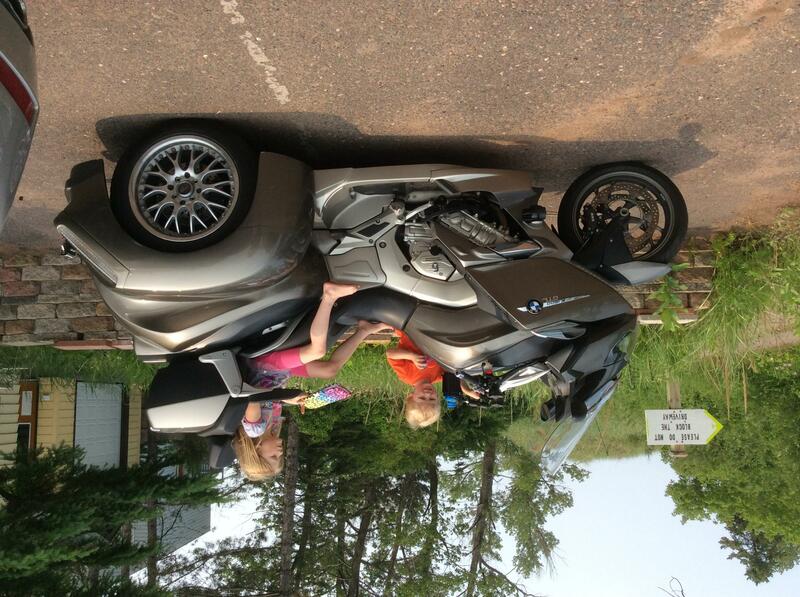 Don’t know why the picture of my grandkids on the trike is upside down. It’s right side up on my computer.